A new, independent automotive manufacturer, Qoros, has unwrapped its debut vehicle, the GQ3, with the official, physical debut to be held at the 2013 Geneva Motor Show. 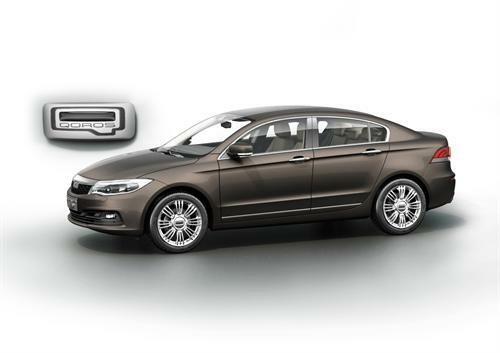 The Qoros GQ3 is a compact saloon in the luxury C-segment and will be marketed in Europe and China. Although no plans have been given for a North American release, the car is unique and shows that with the recent shakeups in the market due to the global economic climate, the time may be ripe for a newcomer to step up and make a name for itself. If that's the intention, the Qoros GQ3 is definitely a statement. The elegant compact has unique, but classic styling and as a flagship for other planned models by the new company it certainly holds its own in the luxury segment. Qoros itself is a company formed in 2007 in an equal partnership between Chery Automotive of China and Israel Corporation, a global industry holding company. Qoros' CEO is Guo Qian, who is also President, with Deputy CEO Volker Steinwascher of IC acting as second. Component suppliers Magna Steyr, TRW, Continental, Bosch, Microsoft and Iconmobile are also on board to help launch the new company. Corporate HQ is in Changshu, China and a production facility is under construction in Changshu with a planned capacity of 150,000 units annually with expansion capabilities to 450,000 units. After its debut in March at Geneva, the car will begin selling in China as early as this fall. The GQ3 has good styling, though it is not stand out. A somewhat sporty profile is offset by deep edged lines along the door sills and lower panels, the straight cuts adding a squarish look to the sedan's rounded roofline. From the front, though, the strong stance of the GQ3 can be seen, making it obvious that this car is one of the widest in its class - emphasized by both the wide footprint and the strong swage lines just visible as they begin over the headlamps atop wide wheel arches. The interior of the car is all about comfort and luxurious style. For the segment, the GQ3 will offer a huge amount of room inside and the floating dashboard enhances this feeling. At center stage is the 8-inch touch screen infortainment system from which most of the car's non-driving controls are manipulated. Proprietary, in-house software from Qoros powers the unit and is aimed specifically at a young, always-connected user with connectivity and integration that anyone familiar with smart phones will find intuitive. The GQ3 is designed to ace both European and Chinese crash tests with a host of standard advanced safety technologies. Qoros has not given details on the car's power plant or drive train, but it will likely be one (or two) of Chery Automotive's 4-cylinder engines. Perhaps the ATECO 1.8L that Fiat licenses for the Linea, which would have the advantage of already being approved in the EU. The Linea would be a direct competitor to the GQ3 in Europe. Whatever the case, the Qoros GQ3 is a bold statement and first step forward for this newcomer to the automotive market.